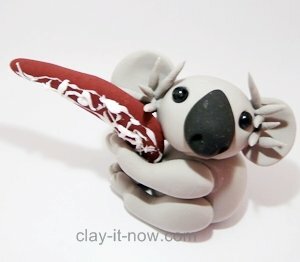 Cute koala and boomerang toy or real boomerangs are the items mostly bought by first-timer visitors to Australia as souvenirs. These because koalas are native to Australia. You cannot find them anywhere else in the world. When we moved to our new house in western side of Melbourne, we saw rows and rows of eucalyptus trees and we asked each other whether the koalas will visit us one day. We thought about it because we know that koalas spent most of their life in the tops of eucalyptus trees. As you know, koala’s main source of foods are eucalyptus leaves. Koala is not a bear! Some people outside Australia called them koala bear or tree-bear because they look similar to bear from far. But, they are not. Baby koala is known as "Joey". The length of Joey is only about 2 centimeters, born without hair or fur and blind. The koala is the official fauna symbol of Queensland, Australia. According to Queensland’s government website, the koala name derived from the indigenous word means "no drink". Indeed the koalas seldom drink the water. You can see more information about koala at the Australian Koala Foundation website including the effort to save our cute koala. As for the boomerang, no one is sure about its origin. However, the famous boomerang in Australia is a returning boomerang which commonly used for sport, leisure or recreation. Inside Wikipedia, you will see that the oldest Australian Aboriginal boomerangs are ten thousand years old. In this web page, I would like to share with you how to make a boomerang toy with clay. 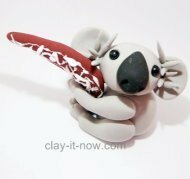 Also, If you have not been to Australia but would like to have koala in your figurine collections or if you'd been there and would like to make your own souvenirs, I’ll be happy to guide you along to make them. 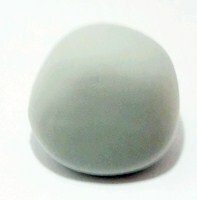 Firstly, roll light grey color clay to round then oval shape & slightly flatten it. After that add the line for the mouth. I made a sad face with inverted V line. You can make a happy smile if you want. 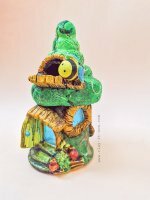 You can also have a small hole or other shapes to create different expressions. Next, roll 2 small balls shape and flatten them for koala's ears. 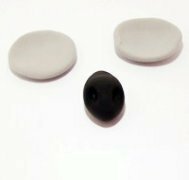 Also, roll a teardrop shape in black color for the nose and two small balls for koala's eyes. 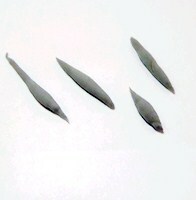 Prepare some spaghetti shape clay to represent the fur.Vary the length and size of the strands. Mark the location of the eyes, ears and nose and attach all elements to the head including the small spaghetti strands. We are making koala's body now. Start with a ball shape and then flatten it to a tapered cube. 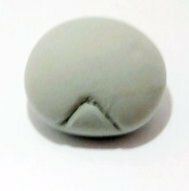 Prepare 4 balls of clay, two larger balls for the legs and two smaller balls for the arms.Shape these balls to teardrop, slightly flatten it and create the lines at the tip with your clay tools. For boomerang toy, roll brown color clay.. Follow the shape as shown in the first picture above, decorate your boomerang with white clay or other colors and you have cute boomerang. After that, slip in the boomerang in between koala's legs and arms. Mark the head location on the upper torso and insert a toothpick to hold the head. Now, attached the koala's head to its body. That's it! 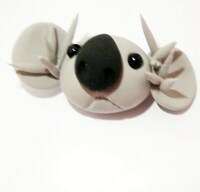 Your cute koala with boomerang toy is done.